HARD BOILED MYSTERY FINDS ITS VOICE! ‘THE COWBOY DETECTIVE: A MATTER OF TERROR’ NOW AVAILABLE AS AUDIOBOOK! Pulp and Noir collide in Greg Norgaard’s popular THE COWBOY DETECTIVE: A MATTER OF TERROR. This hard hitting digest novel is now available as a top quality audio book produced by Radio Archives! Terror in the City… From the moment a crazed Nazi Doctor set foot in Chicago, he knew he was in the right place to finish the experiments he had started but never completed. His work began at a death camp, a camp of horrors in which he reigned with his own brand of terror. As soon as he committed his first act against an unsuspecting woman in the city, he knew there'd be a price on his head, and he didn't care. For this Nazi had the most beloved memory a man can have . . . the feeling of exhilaration as another's fear turns to panic. Below the rough underbelly of the city, there exists stalwart Detective Glenn Stroud. An efficient, dangerous, and committed cop who has always sought the evils that roam his town and threaten those closest to him. With his skills with a gun, his partner E Dent, and a souped up Pontiac Chieftain, Detective Stroud will search for the maniac while following the clues. His determination will lead to the end of this kidnapping and torturing psychopath . . . that, or he’ll lose everyone dear to him. 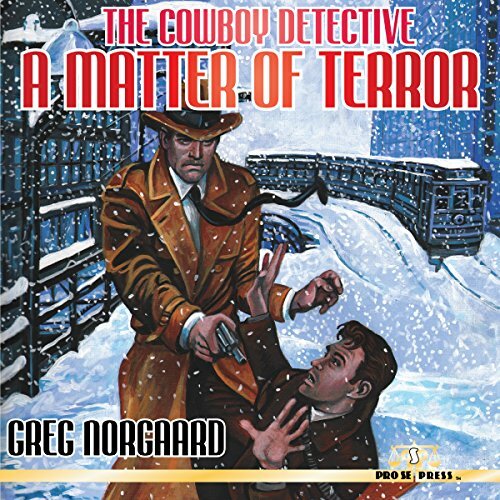 THE COWBOY DETECTIVE: A MATTER OF TERROR by Greg Norgaard. From Pro Se Productions. This hard boiled audio book is also available on Audible and Itunes. THE COWBOY DETECTIVE: A MATTER OF TERROR is available in print and digital formats at Amazon and www.prose-press.com. GENRE FICTION TAKES FLIGHT! “ALTERNATIVE AIR ADVENTURES ” DEBUTS FROM PRO SE PRODUCTIONS!